I spent the year before graduate school doing research at the Institute of Astronomy in Cambridge. While I was there, Martin Rees (later Sir Martin, and now Lord Rees) gave a talk to the new graduate students on the best way to choose a Ph.D. dissertation topic. I remember him saying, "Don't choose a problem that Poincare couldn't solve. Choose a problem that Poincare never heard of." But let me dial up the challenge even more. There's a physics problem so difficult, so intractable, that even Isaac Newton, undoubtedly the greatest physicist who ever lived, couldn't solve it. And it's defied everyone else's attempts ever since then. Now add a third body, and everything falls apart. The problem goes from one that a smart undergraduate can tackle to one that has defied solution for 400 years. There are a few special cases that are much easier to solve. If the third body is so small that it doesn't affect the motion of the other two, then it just moves around in the gravitational field of the first two bodies as they orbit each other. 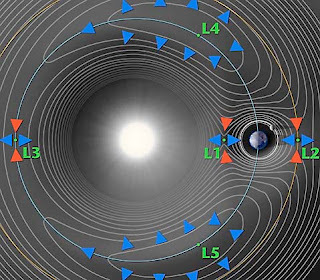 This can give rise to some complex orbits for the third body, and it produces the famous "Lagrange points" illustrated here for the Earth-Sun system. These are points at which the smallest body can orbit in sync with the two bigger bodies without being pulled away. But when the three bodies are all roughly equal in size, there's no way to solve the problem. We can use computers to visualize the motion, but that doesn't always give great insight into what's going on. And some truly bizarre motions are possible. Cristopher Moore at the Santa Fe Institute has compiled movies of some of them, which you can view here. Perhaps the most unusual is the figure-8 trajectory, in which the three masses all chase each other around a figure 8. Weird! The three-body problem figures prominently in the novel of the same name by Liu Cixin, which I thought was pretty good but not great. 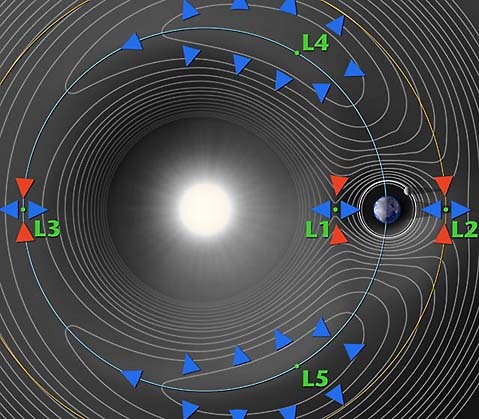 The conclusion: don't choose the three-body problem for your dissertation topic. Just don't.